I have used a black paper from Bazzil, 21 x 29 cms. The red is a little bit I had in my stack. On the red I have put from the Hobby Journal, Hobby Dots. I do not know if you know them, they are little peel off in different shapes and you can make from them a shape as you can see on my card. I have put a flower and a ribbon together on the card. The flower is from a shop here. On the red paper I have done some eyelets. First I wanted to do a ribbon but I think it is too much so just eyelets. 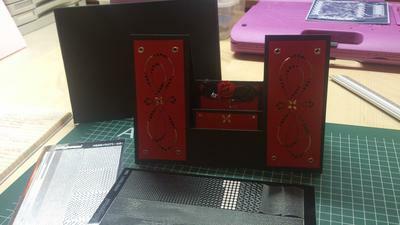 Very dramatic colors for this step card and although they look intricate Step Cards are relatively easy to do. There are ant tutorials on the different types of Step Cards that Rinda has used and you can find them in the Tutorials section in the NavBar to your left. Hi Rinda. This is a really beautiful card! I don't think the photo does it justice, however. The for lighting of the photo is a little dark and is hard to pick up the details. You did a nice job on it and should be very proud! Well done!